We found repetition of certain phrases throughout the first chapter of the Lotus Sutra. To mark each repeated phrase, idea, or string of words, we assigned a "key word" to each phrase. This key word simply identifies the phrase and distinguishes the phrase against the other repeated phrases. We then sorted each key word into a category that reflects the idea or theme being emphasized by the repeated phrase. To see all of the repeated phrases in the text, see the List of Repetitions. Below, we give the category name in all caps followed by the key words in that category, each displaying the number of times that phrases of that key word appear in the chapter in parentheses. If you click on the category title, there is an analysis of the words in the category and why having this category of repeated words helps the Lotus Sutra as a teaching tool. the great Dharma occurs 2 times. rain down the great Dharma occurs 1 time. blow the conch of the great Dharma occurs 1 time. beat the drum of the great Dharma occurs 1 time. reveal the meaning of the great Dharma occurs 1 time. the True Dharma occurs 1 time. Lotus Sutra occurs 4 times. Mahayana sutra occurs 2 times. 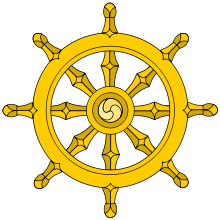 Mahayana sutra called Saddharmapuṇḍarīka, the White Lotus of the Marvelous Law (hereafter Lotus Sutra) occurs 1 time. Mahayana sutra called the Lotus Sutra occurs 1 time. the Lotus Sutra occurs 1 time. As numerous as the sands of the Ganges River occurs 3 times. Equal in number to the sands of the Ganges River occurs 1 time. remained sitting for sixty intermediate kalpas occurs 1 time. exposition for sixty intermediate kalpas occurs 1 time. sixty intermediate kalpas occurs 1 time. the full period of eighty intermediate kalpas occurs 1 time. Innumerable incalculable kalpas ago, occurs 1 time. full period of sixty intermediate kalpas occurs 1 time. In koṭis of kalpas! occurs 1 time. For eighty intermediate kalpas occurs 1 time. buddha path occurs 5 times. supreme path occurs 1 time. highest path occurs 1 time. To the Buddha and the sangha occurs 3 times. To the Buddha and the sangha. occurs 1 time. several hundreds of thousands of attendants occurs 4 times. several hundreds of thousands of attendants. occurs 1 time. several hundreds of thousands of his attendants occurs 1 time. For thousands of myriads of koṭis occurs 1 time. thousands of myriads of koṭis occurs 1 time. innumerable hundreds of thousands of myriads of koṭis occurs 1 time. he was able to meet innumerable hundreds of thousands of myriads of koṭis occurs 1 time. eighty thousand bodhisattva mahā sattvas occurs 1 time. eighty thousand such bodhisattva mahāsattvas occurs 1 time. a ray of light occurs 1 time. It illuminated all the eighteen thousand worlds in the east, occurs 1 time. great ray of light that illuminates the eighteen thousand worlds in the east occurs 1 time. great ray of light occurs 1 time. Illuminates the eighteen thousand worlds, occurs 1 time. They illuminate the Buddha-Dharma occurs 1 time. emit this ray of light? occurs 1 time. emitting this ray of light occurs 1 time. emitted a ray of light occurs 1 time. tuft of white hair between his eyebrows occurs 2 times. From the tuft of white hair occurs 1 time. Between his eyebrows occurs 1 time. From the tuft between his eyebrows occurs 1 time. Māndārava and great māndārava flowers, mañjūṣaka and great mañjūṣaka flowers then fell like rain from the sky occurs 1 time. Raining down māndārava and mañjūṣaka flowers occurs 1 time. “Then māndārava and great māndārava flowers, mañjūṣaka and great mañjūṣaka flowers fell like rain from the sky occurs 1 time. The heavenly māndārava flowers occurs 1 time. the whole buddha world quaked in six ways occurs 1 time. And this world quakes in six ways occurs 1 time. And the whole buddha world quaked in six ways occurs 1 time. All of the buddha worlds suddenly quaked greatly occurs 1 time. paid homage occurs 1 time. rendered homage to occurs 1 time. Completely Enlightened occurs 1 time. humans and nonhumans as monks, nuns, laymen, and laywomen, the devas, nāgas, yakṣas, gandharvas, asuras, garuḍas, kiṃnaras, mahoragas, kings, and noble emperors, occurs 1 time. monks, nuns, laymen, and laywomen and those who had practiced and achieved the path were also to be seen occurs 1 time. monks, nuns, laymen, and laywomen, devas, nāgas, yakṣas, and others occurs 1 time. monks, nuns, laymen, and laywomen and of the nāgas, yakṣas, and other beings in that gathering occurs 1 time. good in the beginning occurs 1 time. good in the middle occurs 1 time. good in the end occurs 1 time. good in the beginning, the middle, and the end. occurs 1 time. O sons of a virtuous family! occurs 3 times.